"Zune HD is the first portable media player that combines a built-in HD Radio receiver, high-definition (HD) video output capabilities, organic light-emitting diode (OLED) touch screen, Wi-Fi and an Internet browser. Zune HD brings a new level of listening and viewing experiences to the portable media player category." 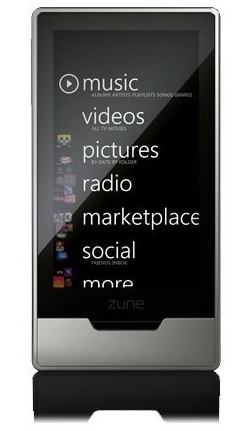 The Zune HD has shown up on Amazon.com, but strangely, there's not much in the way of new information - there's no price, no capacity information, no information about supported file formats, battery life, battery capacity, etc. Some of the other sites that have posted this news are talking up the Xbox Live integration angle, specifically the Xbox Live Arcade games, but without an explicit mention of this feature in the text, I'm highly dubious this is something we'll come fall of this year. Here's one thing I'm hoping for: the text mentions the dock as being required for HD output, but I wonder if Microsoft will also release a cable that will allow the HD output to function? I can see myself loading up the Zune HD with some content and wanting to plug it into a hotel room TV - assuming that TV has HDMI - and doing so with a cable would be easy for traveling. A dock? Kind of a clunky solution for someone who travels.